No storage? No problem. These external hard drives are here to help. We've found some fantastic early Cyber Monday deals on external hard drives. The Black Friday weekend has seen the price of leading external hard drives come crashing down, meaning that you can pick up more digital room for less. Scroll down to see the best external hard drive deals we've found so far. We're not sure how long stock or the deal will last, so if one of them looks, we'd recommend snapping it up. Save 26%: Built for reliability, this shock tolerant external hard drive is more than capable of keeping your assets safe and sound. Suitable for both Windows and Mac OS X. 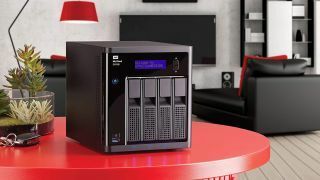 Save £34: Organise all of your media with this external hard drive's centralised network storage. Complete with multiple backup options, there's no risk of losing work with this external hard drive. Save 18%: Save your content securely and access it anywhere with this external hard drive's internet connection via the My Cloud mobile app. Save 38%: Robust, internet enabled and boasting 114 MB/s transfer speeds, this is the external hard drive to get if you need fast streaming on the move.